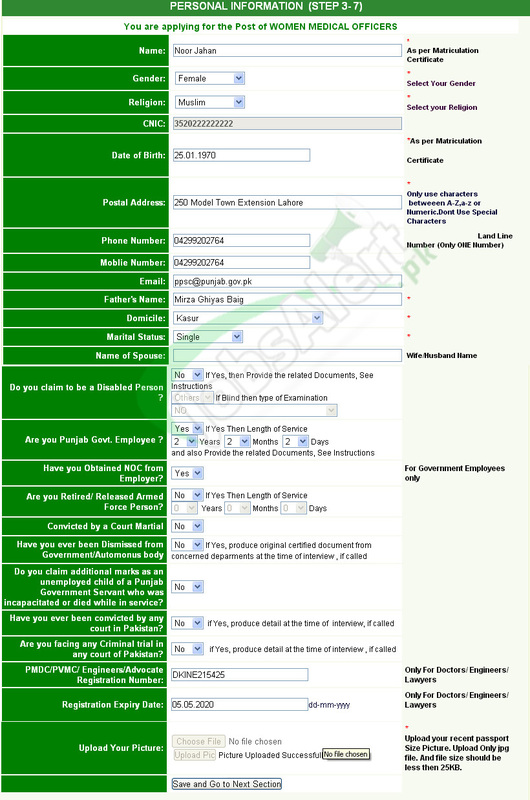 This step consist of candidate’s personal information regarding name, father’s name, CNIC number, date of birth, native town and so many more. Fill the name column first. Select the religion to which one belongs. Write the correct CNIC number. Write the date of birth. Fill the postal address column accurately and completely. Write you’r mobile or telephone number. Name of spouse according to marital status it is required. If one is disable person so tick right sign if not tick the wrong option. If you belong to any government employee then mark that province name and your service month and year also. If one have obtained NOC from employee so mark yes if not then write no in the blank. If a person is retired so mark yes as it is asked if not then mark not. If a person is convicted by law or court as offensive if it’s true than mark yes if not true than mark no option. If a person is dismissed from any government sector job if yes so mark yes if no so mark no in the form. If a person is having any criminal record than person have to produce detail at that time of interview. PMDC/PVMC/Engineers/ Advocates registration number is required and this is for doctors, lawyers and engineers only. Registration expiry date is also needed for doctors and engineers only. Finally one have upload his/her picture which should be less than 25 kb in size.